Chris Meade is a digital writer and director of if:book UK, the think and do tank exploring digital possibilities for literature, partners with the Institute for the Future of the Book in New York. Chris was previously Director of Booktrust and the Poetry Society where he set up the Poetry Cafe and the Poetry Places scheme of residencies and commissions. Chris has an M.A. in Creative Writing & New Media from De Montfort University and is completing a PhD in Digital Writing at Bath Spa University. In 2015 he became a member of Academy Inegales, working with improvising musicians, poets and translators on new ways to perform literature live. 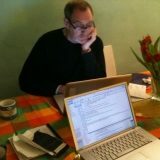 He is the founder of www.ifsopress.com developing transmedia and collaborative literature projects.